Уран: "Libertad y Orden" эсп. Частр: ¡Oh, Gloria Inmarcesible! эсп. (Аһу Ик Балһсн бас) Bogotá D.C.
Орн нутгин келн улс The languages and dialects of ethnic groups are also official in their territories. 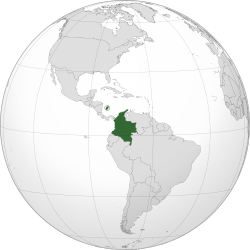 ↑ Constitution of Colombia, 1991 (Article 10) эсп. Эн халхин отхн сольсн: 18:21, 27 Ноха сарин 2014.